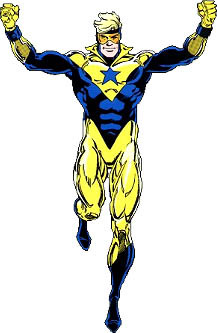 First Appearance: Booster Gold (vol. 1) #1 (Feb. 1986): "The Big Fall"
Armageddon 2001 #1 (May 1991): "Darktime"
Armageddon 2001 #2 (Oct. 1991): "Conclusion"
Batman: The Return of Bruce Wayne #1 (Early June 2010): "Part One: Shadow on Stone"
Justice League (vol. 1) #4 (Aug. 1987): "Winning Hand"
Justice League (vol. 1) #5 (Sep. 1987): "Gray Life, Gray Dreams"
Justice League (vol. 1) #6 (Oct. 1987): "Massacre in Gray"
Justice League America #37 (Apr. 1990): "Furballs!" Justice League America #71 (Feb. 1993): "New Look"
Justice League International (vol. 1) #7 (Nov. 1987): "Justice League... International!" Justice League International (vol. 1) #12 (Apr. 1988): "Who is Maxwell Lord?" Millennium #6 (Feb. 1988): "Out"
The Outsiders (vol. 1) #18 (Apr. 1987): "...Rage, Rage Against the Dying of the Light!" Wonder Woman (vol. 2) #175 (Dec. 2001): "The Witch and the Warrior, Part Two: Girl Frenzy"